The hiss of Reanimates’ blighted arrows raining down from the skies sends even veteran soldiers scrambling for cover. Wounds inflicted by these arrows rapidly necrotize: flesh peels away, foulness spreads, and bones crumble and crack. Panic spreads as healthy warriors fall, rotted from within. Able to kill at range and afflict their targets with the blight of the Mistlands, Reanimate Archers inspire fear in even the most stalwart soldiers. 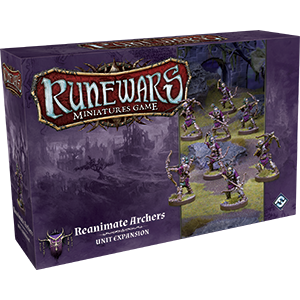 Fire poisoned arrows down on your enemies with eight new Reanimate Archer figures included in the Reanimate Archers Unit Expansion! These eight figures give you the option to field another two-tray unit or increase the size of a larger unit – perhaps fielding a block of archers that will rain death on your foes. Like the Oathsworn Cavalry, these figures are identical to the figures included in the Runewars Core Set, and this expansion gives you an easy way to raise more undead to fight for Waiqar the Undying, while opening dark new paths with give new upgrade cards. The Ankaur Maro Hero Expansion comes with two Ankaur Maro figures for the Waqar in the form of cavalry and infantry versions, as well as six upgrade cards. ​​​​​​​The Daqan Infantry Command Unit Upgrade Expansion introduces four brand-new figures to the armies of the Daqan Lords – a Banner Guard, a Wizard, a Champion, and a Cornicen. ​​​​​​​The Lord Hawthorne Hero Expansion includes two different figures for Lord Hawthorne to add to your Daqan army, a cavalry version and an infantry version, as well as six new upgrade cards. ​​​​​​​Expand your ranks of the undead with the Reanimates Unit Expansion. Featuring eight reanimate plastic figures in four different sculpts, the expansion contains everything you need to add one Reanimates unit to your own army. ​​​​​​​The Rune Golems Unit expansion features two Rune Golem Plastic Figures, one sculpt new to this expansion and one identical to the Rune Golem sculpt found in the Core Set, as well as eight upgrade cards. Extra dice for the Runewars Miniatures Game.